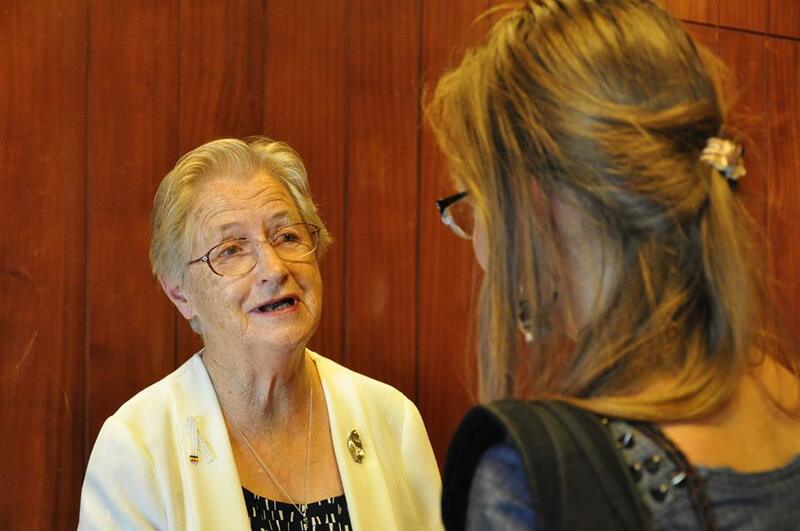 An Irish member of the Medical Missionaries of Mary has been awarded the prestigious Council of Europe’s North-South Prize. Sr Dr Maura Lynch MMM, a doctor-surgeon and obstetrician, was chosen in recognition of her ground-breaking work with women whose lives have been devastated by obstetric fistula in Sub-Saharan Africa. She was nominated for the award by Irish Ambassador Anne Webster and it was presented to her by the President of the Portuguese Republic, Professor Cavaco Silva, in the Portuguese Parliament at the end of June. 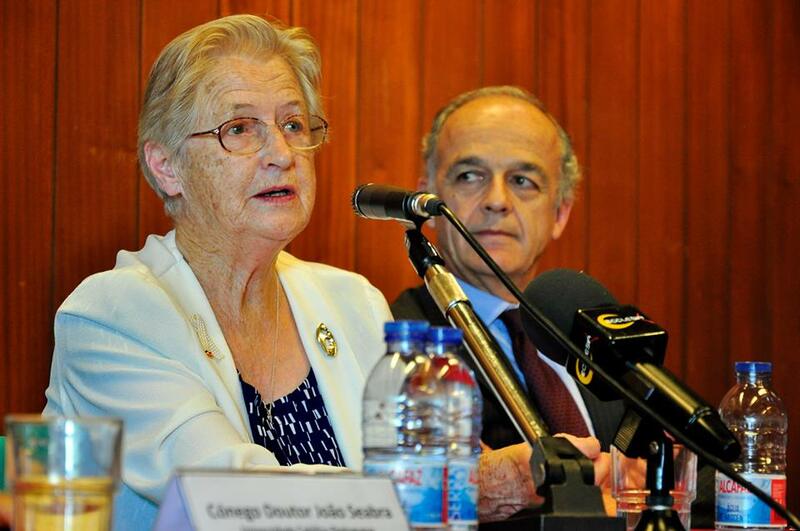 While in Portugal the 77 year old missionary gave a seminar entitled ‘A life dedicated to medical care in Africa’ which was organised by the North-South Centre of the Council of Europe at the Universidade Católica in Lisbon. The North-South Prize of the Council of Europe is awarded every year to two personalities, one from the North and the other from the South. The prize rewards their commitment to the defence and promotion of human rights, democracy and the rule of law as well as to the development of intercultural dialogue and the reinforcement of the North-South partnership and solidarity. 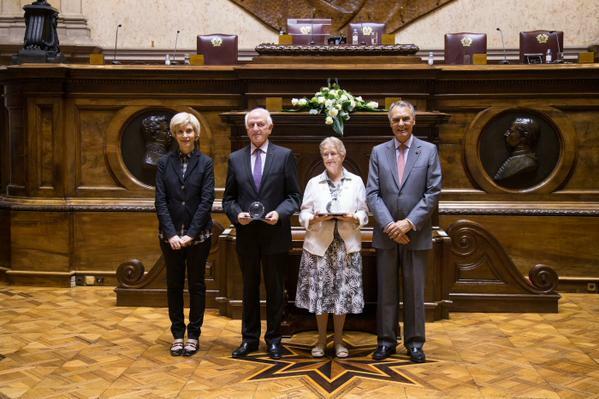 Sr Dr Maura Lynch receiving the North South Award in the Portuguese parliament. Born in 1938, Sr Maura was the fourth of nine children and joined the Medical Missionaries of Mary after school. In 1964, she qualified as medical doctor and did her internship in medicine and surgery. She then went on to obtain a Diploma in Obstetrics and Gynaecology at the Royal College of Obstetrics and Gynaecology in London in 1966. This was followed by a Diploma in Tropical Medicine and Public Health in Lisbon in 1967. That same year she was assigned to the 200-bed Chiulo Mission Hospital in Angola where she acted as medical director while sharing all the clinical work in medicine, surgery, obstetrics and gynaecology, paediatrics, TB and leprosy with another Sister Doctor for 20 years. She also worked as a lecturer and examiner in the Nurses Training School during that time. From 1983 to 1985, she studied for a post graduate fellowship in surgery in Ireland becoming an FRCSI from the Royal College of Surgeons of Ireland, England and Scotland. After her studies she returned to Angola. In 1987, she was assigned to Kitovu Mission Hospital in Uganda as a consultant surgeon/obstetrician/gynaecologist with responsibility for training of medical officers in surgical and obstetrics and gynaecology skills. That year she also spent a month in Nigeria training in obstetric fistula repair. In the early 1990s, she was a co-founder member of the Association of Surgeons of East Africa (A.S.E.A) and in 1993 she initiated the Obstetric Fistula Repair programme inviting specialists from the UK to Kitovu three times a year to carry out 885 fistula repairs. During this time she also encouraged visiting surgeons and other consultants to come to Kitovu under the sponsorship of rotary Doctors Bank of Great Britain and Ireland. This provided consultant services as well as teaching and the passing on of skills to indigenous personnel. Between 1999 and 2004, as interest and gradual awareness and appreciation of the dignity and needs of women in the developing world increased, there was greater recognition of the need for improved maternity services for the reduction and prevention of birth injuries. Between 2004 and 2005, Sr Dr Maura Lynch fundraised and supervised the building of a Fistula Unit in Kitovu with 28 beds. In 2007, she was awarded an honorary Fellowship of Medicine and Medical Sciences from University College Dublin in recognition of her 43 years of medical care in Africa. In 2009, she was nominated by UNFPA (Uganda) as ‘Leader in fight against Fistula’ and this was followed in 2013 with an honorary Fellowship in Obstetric and Gynaecology from London College of Obstetric Gynaecologist (FR.C.O.G).